Holden Owens has put together one of the finest baseball seasons in Polk County history this spring, a season he hopes continues for some time when the state 1A playoffs begin later this week. But the games won’t end for Owens once his Wolverine career comes to a close. 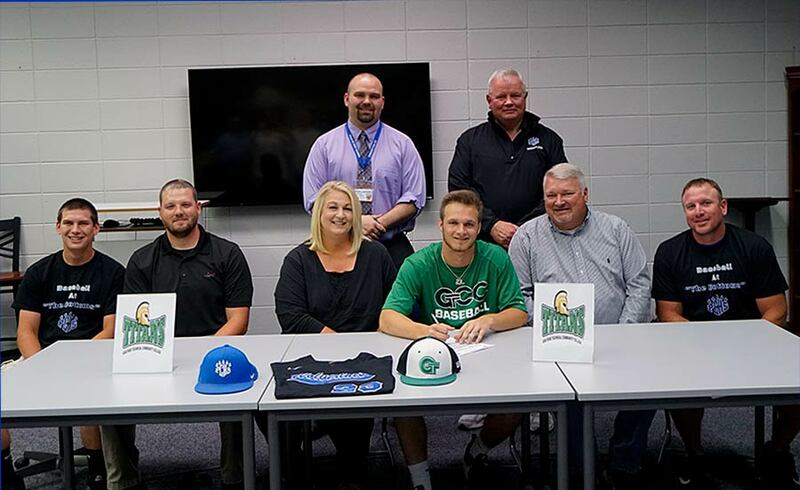 The Polk County senior signed a letter-of-intent Tuesday to play baseball starting this fall at Guilford Technical Community College, a destination he hopes is the springboard to a career at a four-year college. Owens signed his letter during a ceremony in Polk County’s media center with friends, family and coaches watching. He is the sixth Polk County senior with plans to continue his athletic career in college. Hitting has not been an issue this season for Owens, who takes a .522 batting average with 10 home runs and 51 RBI into the playoffs. By the time the season ends, Owens will own a few single-season school record and a few career marks as well. “As I’ve said before, he’s put up video game numbers this season,” said Polk County head coach Billy Alm. “I think he’s found the right fit for him, and he looks happy to be where he’s headed. Guilford Tech ended its 2018 season with a 10-30 record, but the program in the past has sent several players to four-year schools as well as had alumni selected in the yearly Major League Baseball draft. Owens hopes to be the next in the Titans’ pipeline to a higher level of college play. “The UNC Charlotte coach called Coach Alm and said they were looking at me and were interested, but they didn’t have room for me right now,” Owens said. “They want me to go the junior college route. Guilford Tech plans to play Owens at third base, a position he has manned during his Polk County career. It is Owens’ work at the plate, though, that could allow him to become the Wolverines’ first Division I player since Joel Booker competed at that level for Iowa. Booker also began his career at the junior college level. Owens began envisioning a college career during the fall of his junior year. His play this season has made that a reality, and he couldn’t be happier.